In investing, there are a lot of times you will come across information, knowledge proposed that may or may not be outright applicable to the way you build wealth, or as I often put it, applicable to your wealth machine(s). For those knowledge or wisdom that looks to be more suitable for a wealth machine that you are not using, should you not bother with it, discard it totally? I propose that you to slowly form a mental model of these other wealth machines that are not applicable to you now, even though they are not needed. There are some benefits towards why it is recommended for you to do that. Today, we are going to talk about this topic, and I will also give 4 examples how being expose to other wealth machines and wealth topics have changed the way I look at building wealth. What are the information or knowledge we are talking about here? We discussed previously here that to be successful in wealth building over time, one of the key ingredient is knowledge and wisdom. You would probably have one or two selected ways of building wealth that you can do well consistently. These are what we called your wealth machine. In our daily lives we are swamped by too much information and knowledge. Much of these information is not very applicable to your wealth machine. Listening too much to these information and knowledge is just going to confuse you, create more faults with your wealth machine. If your wealth machine is to passively manage a portfolio of stock and bond ETF, the more market news you listen to daily, the more it will force the fear out of you, to do something unnecessary. You would better focus your monthly maintenance effort reading books on personal finance, behavioral finance. If your wealth machine is to actively manage a portfolio of income stocks chosen based on value approach, reading too much of the macroeconomic data such as PMI, USA unemployment rates, USA purchasing and consumer price index isn’t going to be very helpful. You are better off focusing your weekly maintenance effort identifying more prospects to purchase, reading up the development specific to your income stocks. The commonality of these knowledge is that they are mostly high level (meaning not going deep into the subject), that they won’t be useful for you to form an alternate wealth machine on their own, but give you an introduction, or builds on some past knowledge experience on these information. The idea here is to start from a simple take away. If the information presented is quite comprehensive, you can still try to recall 2 to 3 takeaways from this information quickly despite the comprehensive nature of the information. And then with this simple understanding, as you learn more from subsequent information on the subject, it adds on to this basic understanding. Over time you gain a better model of the subject. This is applicable for not just investing. Does this information debunk my previous concept of the subject? One of the main benefits why you need to have this side awareness of other wealth building subject is to prevent your scope to be too narrow. In a lot of discipline, being too narrow breeds a very fixed set of ways to do things, to look at things, and you are trap in a prison of what you cannot do within that discipline itself. In the case of people who do not have a habit of coming across information consistently, they have to depend on the knowledge of what a known expert shares. If the known expert is narrow, they think this is the only way to protect their downside, the only way to execute. You may also develop confirmation bias, which roughly means the bias when you find the facts and knowledge in your way of building wealth. You inevitably search for things that prove your wealth building method is the best and the only method that make sense, ignoring the facts and knowledge that other methods are just as good and perhaps more applicable to their situation. The bias might be even stronger if you are heavily vested in that wealth machine, which is an endowment effect. your brain cannot accept the fact that what you have been doing all this while is flawed. Actively reading things out of the realm of your wealth building method, or things that argues against what you are doing, are some strategies to counteract that bias, which means that it is good to form a high level model of some other wealth machines. I will go through some examples that I came across the way that changed my view on wealth building compared to when I started out, or after I having been building wealth in a certain way for a period of time. Most readers who have followed me for a time would know that my preferred wealth machine is an active management of a portfolio of listed business that generates a stream of cash flow. I try my best to purchase them at a reasonable value, watching more of the downside and let the upside work itself out. I tend to understand what it entails, but one problem that I have a great difficulty in dealing with is to concentrate the portfolio and yet be expose to the risk that we are not the owner operator. We do not have the time to spread out to so much positions, and if we diversify out, we can’t watch each well enough. We also waste our efforts when we put in a good amount of work into it. We have to admit to the problem that we are not full time active managers and have limited time. Yet we do not wish to lose a large part of our capital. When you are not the owner operator, no matter how cosy you get to the management, or how your tentacles spread, you are not going to know when there is deep problems if you are not a towkay. This is perhaps why you being a property manager when you buy and rent, or buy and flip, have more control. One big influence that I have was the idea of holding assets on the strong side of momentum and having a rational exit when we foresee the momentum turning. This is an influence from the work of trend following trading where there should be a momentum stop loss in a certain manner, when it is determine that momentum will be loss. This ensures that you keep profits, most of all it prevents the hidden problems not seen when you are not an owner operator, which may take the stock down from $1.50 to $0.40 and you are still holding on to it. How is this implemented is still in the works. I could be wrong, but I will be testing out some of these guard rails. There are some knowledge that you are glad to come across that you should know it, but if its not presented to you explicitly, it may not occur to you. As an active investor, I learn this from a passive investing source. In my Wealthy Formula, which I show you how wealth is built, and what are the concepts that you can do to make the most impact, I profile what I learned from Vanguard, a fund management shop known more for their passive index funds and exchange traded funds. Too often, we sought to push our money to gain the maximum returns, but what you cannot run away from is more active management, more volatility in the value of your wealth. 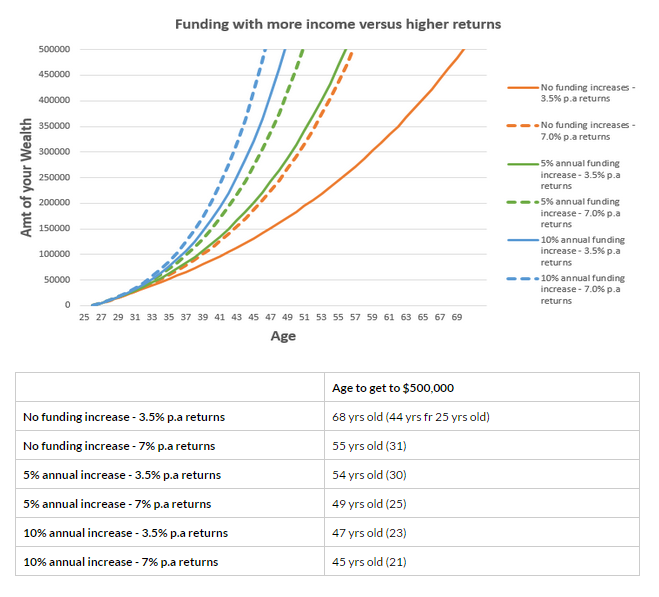 This chart shows that if you increase the amount you put into building wealth at a rate of return of 3.5%, versus no increase in the amount you put into building wealth at a rate of return of 7%, the time you get to $500,000 is quite close. What I learn here is to vary the advice provided to others. For those folks that manage to get into a lucrative career to accumulate $500,000 by the age of 30, they might not have to push their wealth building so hard, especially if their goal is not very demanding. At the end of the day, being clear about what you want, helps you to understand what you need to do, and that may mean using a wealth machine of an insurance endowment, portfolio mainly of bonds or REITs. When I started this journey in 2003, there are little mentioned on this term called financial independence. Even if there is, I wouldn’t be able to tell the difference. 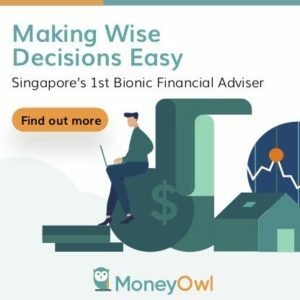 The prevalent topic was to slowly save 15% of your disposable income, together with your CPF and you can retire at 65 years old. At 31 years old, 7 years after I started, I realize that there are other ways to frame things, and that retirement may not be a desirable outcome. And you do not have to take things slowly. You can speed it up. In my article on how much you need to reach financial independence, I describe the desirability of not aiming for retirement but financial security and independence and how much you need. Had I not be exposed to the materials on this area of the subject, because we are not near age 65, we would all be aiming for something that may not be as desirable. The common idea for a lot of people is that what you use to accumulate wealth, will also be how you spend down your wealth. Hence why property is so popular because the withdrawal mechanism of wealth for a property is so elegant. When you understand the objectives of wealth de-accumulate, and what are the common challenges when planning for it, you realize that having the same wealth machine for withdrawing your wealth may not always be ideal. If you have build up $1 million, having $200,000 in an annuity with the other $800,000 in a diversified portfolio might be a better option, then putting $1 million in a diversified portfolio for retirement. The annuity, while providing less appreciation, provides certainty in cash flow in absolute amount, and it offsets the problem of volatility in your portfolio. Again, how you structure that $1 mil, depends on you being clear what you want, and then you will find the best way to do it, after considering the various challenges you are subjected to. This also means you gain the idea that, if you realize your current wealth machine is very intensive in effort, subjected to higher volatility, you can realistically take the current value of $1 mil and switch to another wealth machine. While we say here it is important to form a few mental models so that your view on wealth is developed, the important thing is to be focus on what works well, your main wealth machine. If you keep getting distracted by news, information and knowledge that are not applicable to your wealth machine, and your wealth machine degenerates because you do not execute well, then what good is reading so widely? If your wealth machine is to actively manage a portfolio, then execute well, supplement with knowledge that is applicable, tune out the noise. Tweak the machine only when you think what you add will solve some of the shortcoming or enhance the machine.